I Can't Believe It's Not Butter! : Trick or Treat!! Really though, the kids had a really good day and lots of fun going door to door. Kelsey had all kinds of activities at school, and Jake had two field trips. One in the morning to the Children's Museum, and one in the afternoon to a care home to show off their costumes. So cute! Kelsey is still out with her friends, and Jake and I have been home for about half an hour now. We only went out for an hour or so, but the two of us had lots of fun. Cute pics!! Your daughter looks like she is right from the 70's!! 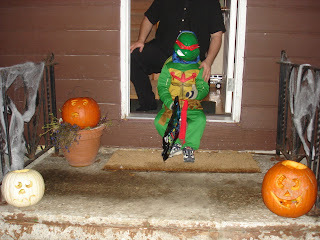 I love Jakes costume.. its so funny when Jarret was 5 he was a Ninja turtle too.. they both looked great Char!!! 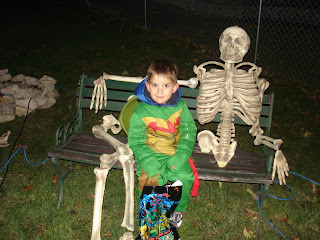 My own Jake had the same costume! I posted a pic too. 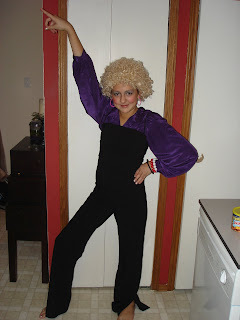 I totally dig Kelsey's look and the fro. Jacob kept flipping the mask up and leaving it on top of his head. We had 6 kids every minute coming to our door. Our house is in a development and sits on a hill. One overweight kid climbed up, collapsed on my steps and told me come over to put the candy in his bag. I told him he's out of shape, to get up and get the candy himself. I told him he had to earn it. Was that mean of me? I said it nicely though. I would have loved to hear you say it (in a nice way though) .. I know!! That's so great!!! It wasn't mean at all! Especially since you said it nicely! HAHAHAHAHA!!! I can just picture the collapsed kid holding out his pillow case breathing heavily and telling you to put the candy in hs bag...HAHAHAHAHAHA!!!! That is EXACTLY how the kid looked, Char! !